After a Tony Parker tying three and an ensuing Kawhi Leonard steal, Coach Gregg Popovich called time to draw up what would be the winning play. San Antonio came out with the man the Thunder were keying on, Tony Parker on the wing. Stephen Jackson begins to curl to the baseline and Parker cuts to the corner. 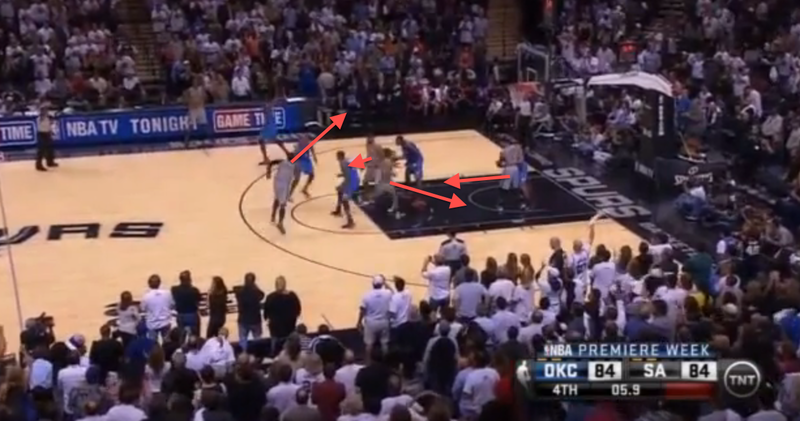 Danny Green (in the block/charge circle) begins to make his move to the top of the key. The Spurs could have just started out in the positions that result from this play, but all the early movement can force switches and confuse a defense. Danny Green gets the ball after a screen from Tim Duncan and waits. 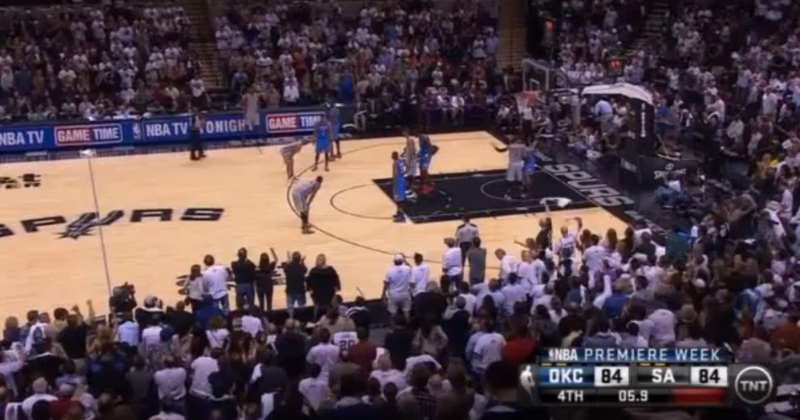 Notice on the baseline how far Russell Westbrook is from his man, Parker. 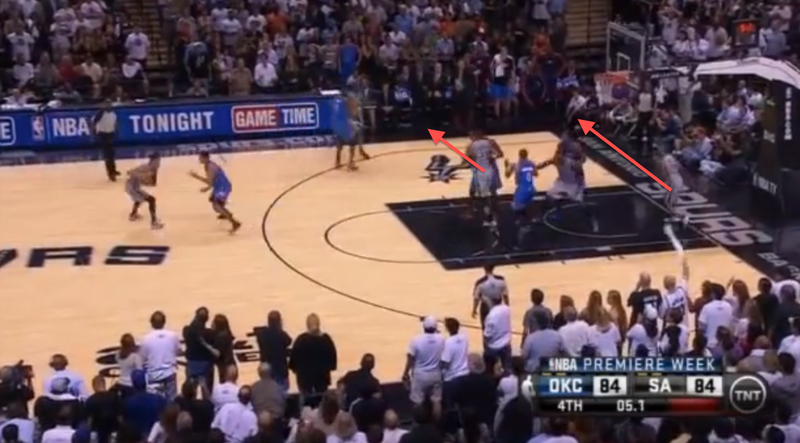 Parker starts to run baseline and Westbrook tries to go over the screens. 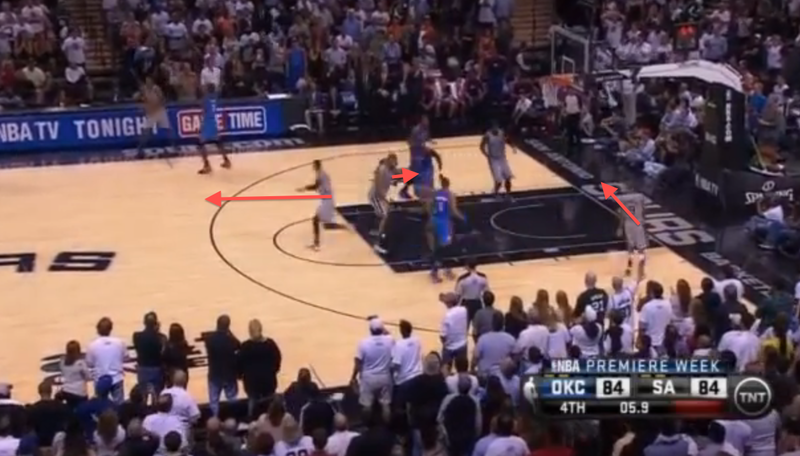 Then, Green starts dribbling right and inexplicably, Westbrook completely abandons his man. You can see Parker completely alone on the far side. 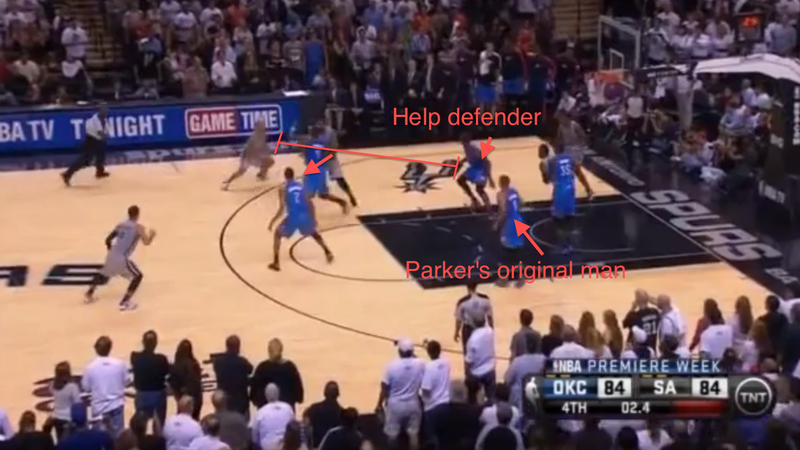 You can also see that Serge Ibaka isn't interested in Parker at all. With Westbrook not there, he can't call for a switch or warn the probable help defender, Ibaka. As you can see in this final shot, Parker's defender is on the complete opposite side of the court and the helper is miles away. Parker takes a bounce and hits the game winning jumper at the buzzer. 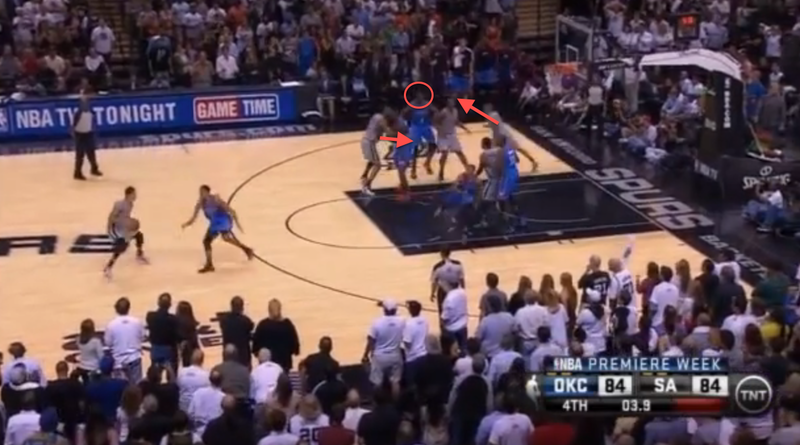 Although this was a great play by the Spurs, a lot of blame has to fall on the Thunder defense and Westbrook. Westbrook probably wouldn't have jumped right in the first place if there had been more communication. It is understandable that the defense is rusty in the season opener, but this is something that will have to be watched moving forward.